When Buckman Beverage began its beer distribution business in Philadelphia, it had to use two very robust workers for every delivery. All kegs were either rolled down ramps or manually lifted out of the back of vehicles and onto hand trucks. The company was using Ford Transits with extended wheelbases for their deliveries and could only hire workers who were physically able to manage the demands of loading and unloading a vehicle’s payload of 25 kegs of beer. And, the vans’ 20-foot vehicle lengths, coupled with their 8-foot ramps (which extended from the rear doors), made it difficult to park and offload in the city. The ramps often couldn’t be used to unload the 160-pound kegs. So Buckman explored post-mounted hoists as an alternative. Unfortunately, post-mounted and fixed-axis cranes have an operational arc and can only lift and lower an object along the fixed trajectory of the crane’s arm, as it pivots around the single axis of the crane’s vertical post. Although the arc’s size can increase or decrease by extending or retracting the crane arm, as a rule, no adjustment can be made under the load. Additionally, the lifting capacity of these cranes is generally diminished proportionately to the crane arm’s extension, sometimes reducing it to less than half the maximum load limit. The single-axis cranes could help transport kegs in and out of vehicles, but once a keg is inside a vehicle, operators have no choice but to move it a second time—either manually or with a hand truck. 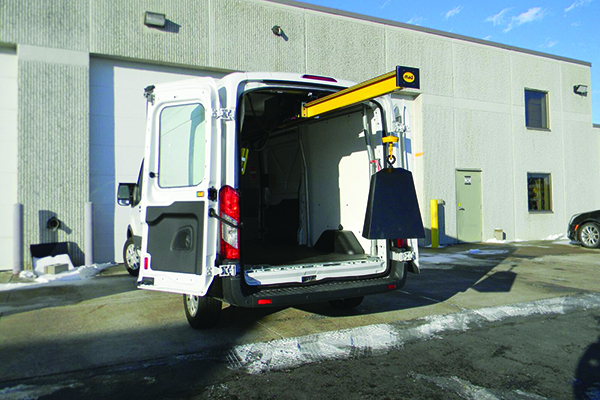 The search led to a crane that was an intelligent alternative to post-mounted and fixed-axis cranes. The crane remains inside vehicles and away from the elements. Yet, unlike post-mounted and fixed-axis cranes, it resides at ceiling height and above shelving. It can also slide to either side of a vehicle or stow in the center of a cargo hold until it’s needed. Its boom is easily positioned because it can move on two axis points, sliding laterally up to 8 feet (depending on the vehicle) and extending up to 45.5 inches in length.